Running a large e-commerce company generally means that you have a lot of work and very little free time. It shouldn't come as a huge surprise. The e-commerce market is extremely competitive. To succeed, online retailers need to be continuously improving their websites to provide a better user experience. However, limitations within the IT department can sometimes make change impossible. 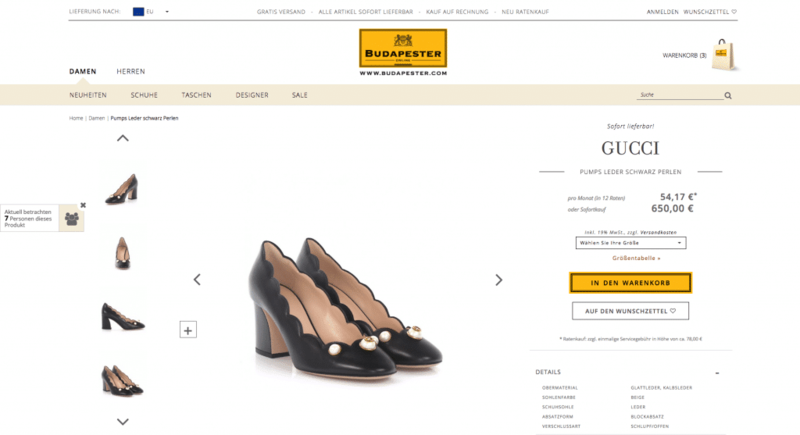 BUDAPESTER is a leading, German online shopping site offering designer shoes, bags and accessories. Finding an effective solution for continuous website improvement to provide a better user experience. Our website is visited by hundreds of thousands of users every month but not as many of them become customers as we would like. That's why we wanted to leverage the expertise of professionals, like the Growcode team, so we could make sure that our online store was doing a good job of converting users into customers. 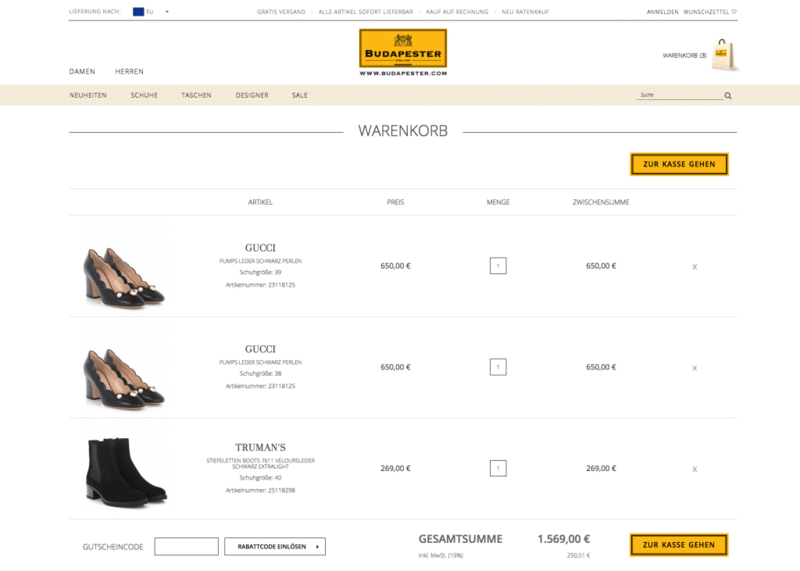 This marked the beginning of the relationship between the German online shoe retailer and the Polish e-commerce optimization firm, Growcode. Why? Well, Growcode allows e-commerce websites to improve their conversion rates by testing and optimizing their online stores without having to involve the IT department. Running tests in the German market was quite a challenge for us," recounts Pawel. "Before we started, we were wondering if German consumers were going to surprise us. Sure enough, they did. The first surprise was that 20% of all traffic was coming from tablets. The next unexpected revelation was that the most popular browser was Safari. It accounted for 53% of the total traffic and 62% of completed transactions. This is completely unheard of in Poland. To improve, you need to understand what’s not working. 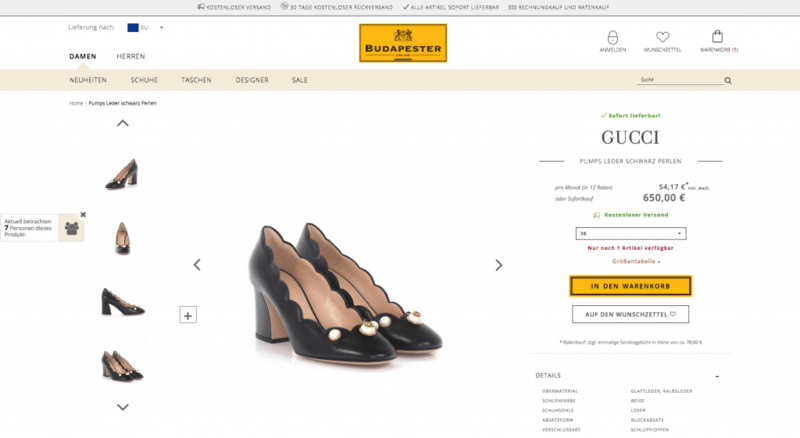 As a first step, the Budapester.com website was expertly analyzed to identify if there were any pain points in the customer journey. 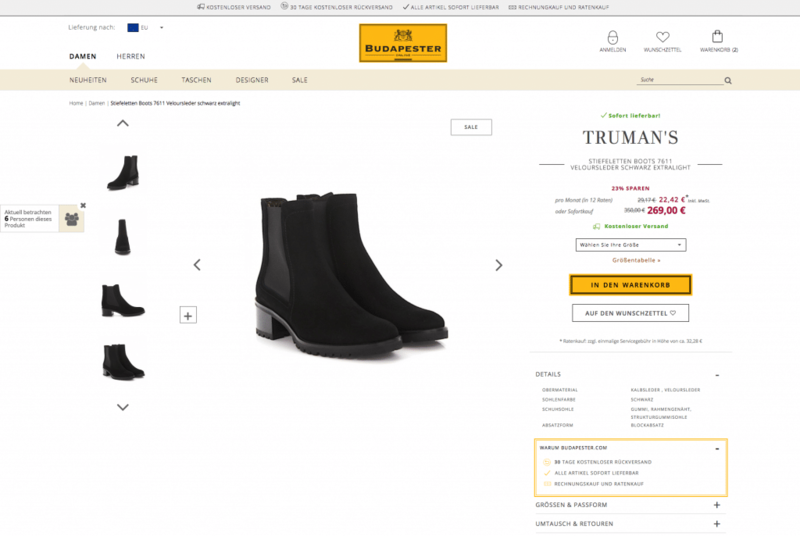 During this phase, it became clear that the product pages and the shopping cart had the potential to make the greatest impact in improving Budapester’s conversion rate. Another interesting finding was the low mobile conversion rate. While the conversion rate on mobile devices is, on average, approximately 50% less than on desktops, the performance of mobile devices was significantly worse than that on Budapester.com. The Growcode analysts also noticed that the website’s header took up a large part of the screen, making the content difficult to view. 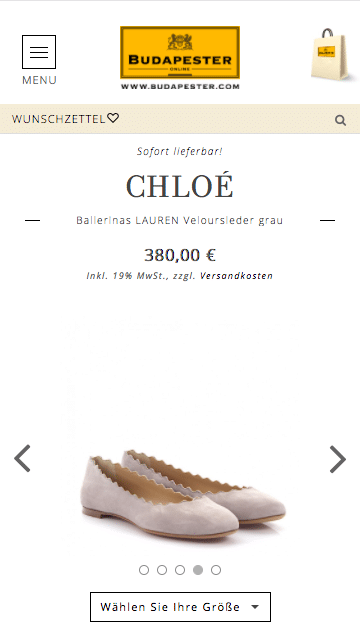 Furthermore, while Budapester had an excellent unique selling proposition (USP), its USP was not consistently visible on all of the site’s pages. Last but not least, when examining the conversion funnel, analysts realized that there were no incentives for the user to buy right now. After identifying these issues, the Growcode team prepared alternative versions of the site using Swiftswap technology. This allowed Budapester to avoid having to involve any of their developers in the project. 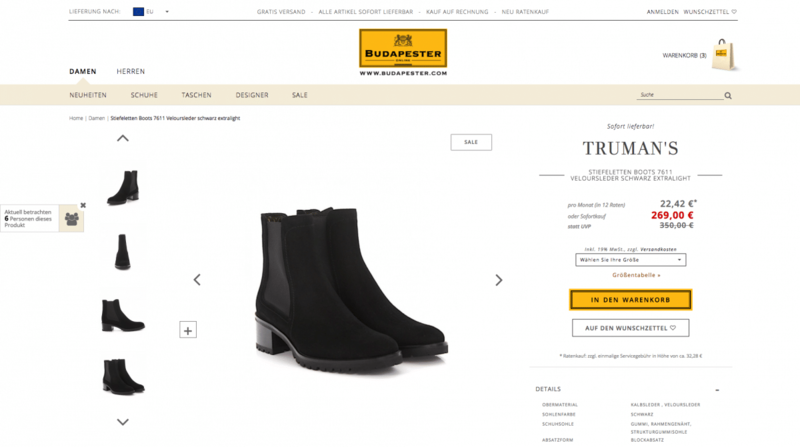 Communicating Budapester’s unique selling proposition more visibly, like free delivery and free returns, would increase the conversion rate. A smaller header would improve user engagement and conversions. A simpler shopping cart would reduce abandonment rates. As part of the test, the USP was added below the item’s description on the product pages. In addition, product availability and incentives, like free shipping, were also given greater emphasis. Since everyone likes free things, highlighting Budapester’s free shipping policy was likely to increase the conversion rate. Furthermore, underscoring the limited availability of products aimed to create a sense of urgency in users, motivating them to make the purchase now. BEFORE: USP wasn’t visible enough and it is a major mistake. Free delivery, availability of products and information about shipping was not emphasized. Therefore customer was not aware of additional value he could use. AFTER: USP was added below the item’s description on the product pages and highlighted in the header on the desktop. Free delivery, availability of products and information about shipping are now highlighted and visible. On mobile USP was also highlighted and added in a frame which makes it more visible for the customers. In order to save some space USP was not highlighted in the header as it was on desktop. To decrease the size of the header, the icons were updated and a new USP was added. The company’s web address was also removed from the logo. As a result, the size of the header was drastically reduced. This made the site far more usable for those visiting on a mobile device or tablet. BEFORE: In the original version information about free delivery isn’t visible enough. Another problematic thing is very high header and cart icon which does not resemble a cart much. On a mobile version cart icon also does not resemble a cart much plus it lacks description. USP isn’t visible enough. AFTER: Site header is now lower so the most important content goes up. Icons were changed to make them even more evident for users. On the mobile version of the website, the cart icon was changed to make it more clear and the description was added. Also the favourites icon was moved to the main menu. The shopping cart was updated to include an alert that notified users when there was only one product left in stock. This aimed to encourage users to purchase the item immediately instead of waiting until later. Discounts were also emphasized and items that included free shipping were highlighted by changing the font color. Finally, the discount code section was hidden to simplify the shopping cart interface. In only 10 days, all of the changes were implemented and tested to make sure all users on all devices had a seamless experience. BEFORE: Before the changes, free delivery information was not prominent enough, even though it is a vital part of Budapester’s USP. What is more, discounted prices were not highlighted. AFTER: After the changes availability of products, discounted prices and free delivery are clearly communicated and visible. We used bright colors intentionally to make them more eye-catching. Every single change from the desktop version was adapted to the mobile devices. Changes are great but the only thing that really matters is results. As expected, these changes made a big impact. During the test, Budapester’s conversion rate increased by as much as 12.5%. On mobile devices, the performance was even better. The tested changes improved the mobile conversion rate by as much as 29%! While all the updates had an impact, the new and improved shopping cart proved to be the biggest contributor to the uptick in conversions. To translate these percentages into monetary terms, improving the conversion rate by 12.5% means the same thing as increasing revenue by 12.5%. 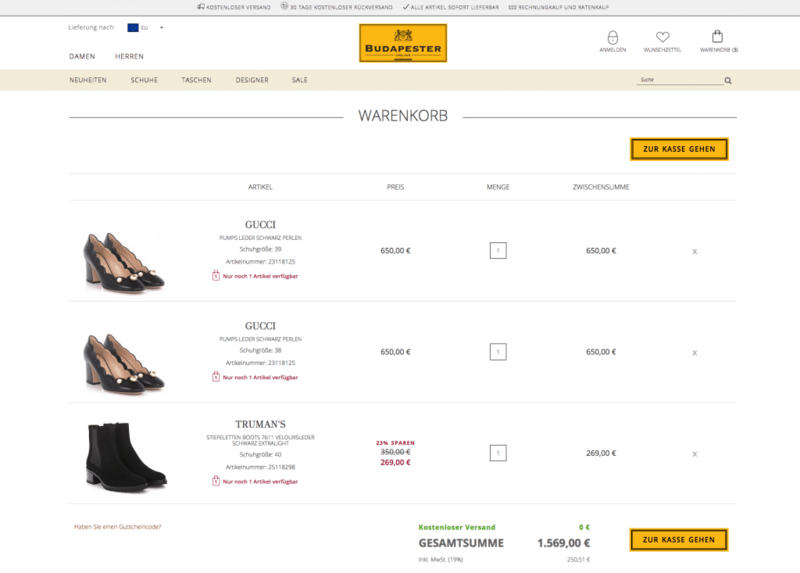 So, if Budapester had monthly sales of 120,000 EUR, the increased conversion rate meant that they brought in an additional 15,000 EUR each month. Not bad considering that it only took six weeks of working with Growcode to get these results. We are very pleased with what we have managed to achieve with Growcode. From the very beginning, we felt that working with Growcode was going to help increase sales. We loved their team's professional approach and, of course, the results. Still, that doesn't mean that we're satisfied. We believe that we can improve even more. That's why we want to continue working with Growcode for a long time. We're excited to see what the future holds. We are already planning the next tests with Budapester. We have already developed some recommendations that will allow us to further increase the conversion rate. We're always aiming to do better. While improving mobile revenue by 29% is a great start, I'm looking forward to increasing it even more.